The Portland Winterhawks face an uphill battle to overtake the Everett Silvertips for the U.S. Division title, but looked every part a playoff threat in their three wins Saturday to Monday. And a long Western Hockey League playoff run would be nice just for the chance to watch Joachim Blichfeld and Cody Glass work their magic. Blichfeld, the 20-year-old San Jose Sharks prospect from Denmark, scored six consecutive goals for Portland starting in Sunday's win over Seattle and including Monday's big victory over the Vancouver Giants. The outburst pushed Blichfeld's league lead to 51 goals in 58 games this season. He also has 51 assists to lead the league in points with 102. But Blichfeld's back-to-back hat tricks were not the biggest news of the week for Portland. That, and a contributing factor in Blichfeld's weekend, was the return of Cody Glass from the knee injury that kept him out for eight games. Glass scored an empty-net goal in his return game on Saturday against Red Deer, then had assists on all three Blichfeld goals on Sunday against Seattle. His return helps to explain how life returned to a Portland power play that had lost its power. The Hawks went 2 for 3 against Seattle and 2 for 5 at Vancouver — after going 1 for 30 in the eight games after the Glass injury. A chance to practice several days in a row last week clearly helped the power play, too. Glass did not play Portland's third game in third game in 48 hours on Monday, sitting out the win at Vancouver as he works his way back to full fitness. The absence of Glass made Monday's 5-3 road win over the Giants even more impressive. The Giants had won seven in a row to surge to the best record in the Western Conference before Blichfeld staked Portland to a 3-0 lead. • The Winterhawks have clinched a playoff berth for the 10th season in a row. At 36-16-3-3, they are five points behind Everett but must play seven of their 10 remaining regular-season games on the road — beginning at 7 p.m. Friday at Tri-City and 6 p.m. Saturday at Seattle. The Silvertips have 11 games remaining. • Joel Hofer of Portland was named WHL Goaltender of the Week on Monday, after stopping 59 of 61 shots in the wins over Red Deer and Seattle. A St. Louis Blues prospect, Hofer made 25 saves in Saturday's win over Red Deer for his third shutout in 11 games since coming to Portland in a January trade with Swift Current. 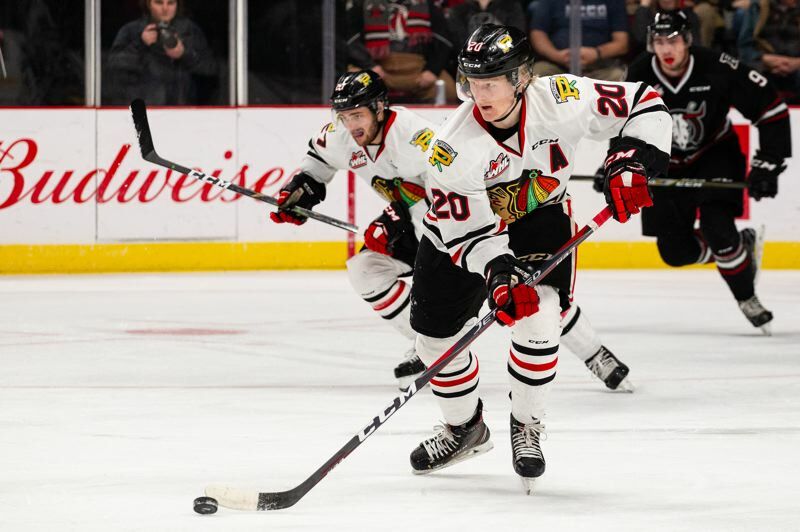 • Brendan De Jong was listed on Sunday as week-to-week by Winterhawks VP/GM/coach Mike Johnston. The 20-year-old defenseman has missed the last four games. He suffered a lower-body injury on Feb. 9 in a loss at Everett.